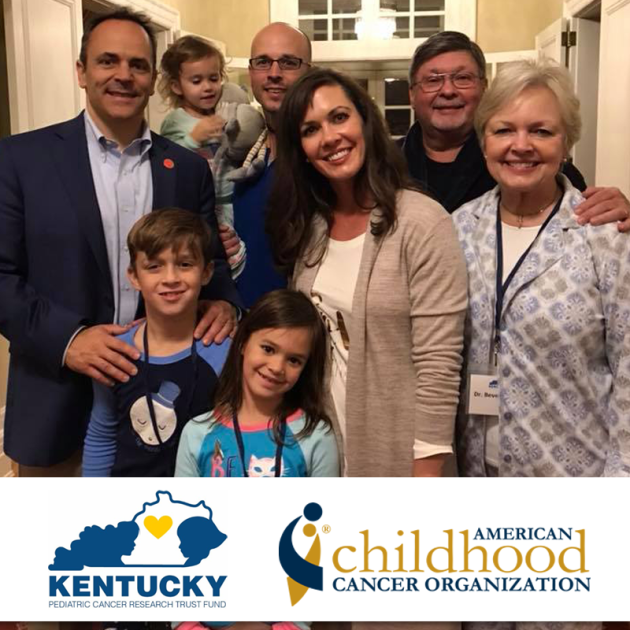 FOR IMMEDIATE RELEASE – January 21, 2018 – Frankfort, KY – In Governor Matt Bevin’s budget, and filed as House Bill 200 on Wednesday, a historical $5 million dollars has been proposed for innovative childhood cancer research for Kentucky children battling cancer. This is the first time a Kentucky Governor has included a specific appropriation for pediatric cancer research. With $2.4 million in matching funds from local universities, the total amount for childhood cancer research in the upcoming biennium will be $7.4 million. Despite childhood cancer being the number one cause of death by disease in the United States, research funding specifically for childhood cancer is less than four percent of all national cancer funding. In the last 3 biennium Kentucky state budgets over $15 million dollars[i] has been allocated to adult cancer research for lung, colon, breast, ovarian, and cervical cancer. Although adult cancer research is imperative, it is not widely known that adult cancer research does not translate to improved outcomes for children. Children are not small adults and adult based cancer research or treatments are not effective for addressing childhood cancer because they often originate in different parts of the body and have different molecular targets than adult cancer. The Trust Fund proposals emphasize compassionate innovation as well as collaboration with the state’s two Children’s Oncology Group hospitals. Lars Wagner, Chief of Pediatric Hematology/Oncology at the University of Kentucky states, “This is an exciting time for children as the state prioritizes research to help address the number one cause of pediatric deaths from disease.” Ashok Raj, MD, Chief of Pediatric Hematology/Oncology for the University of Louisville and Norton Children’s Hospital says, “This is the single largest initiative for childhood cancer ever in Kentucky. I believe where you live should not determine how your child fights cancer.” Currently Kentucky children diagnosed with cancer are limited in clinical trials and sometimes must travel out of state – even across the country – to have access to the latest in scientific advancements. Current proposals emphasize immunology, cellular and molecular therapy and more targeted genomic based treatment with less toxicity. The Kentucky Pediatric Cancer Research Trust Fund says that of particular concern is the very alarming rate of pediatric brain tumors found in 40 counties in Eastern Kentucky. In a contiguous 40 county area there is a 42% rate increase of pediatric brain tumors compared to the same age-adjusted population in the rest of the United States. Pediatric brain tumors are now the number one cause of pediatric cancer death having recently surpassed leukemia[ii]. To learn more about the KY Pediatric Cancer Research Trust Fund, KY Pediatric Cancer Foundation, and the Why Not Kids effort please visit www.whynotkids.com. To learn more about the American Childhood Cancer Organization visit www.acco.org. The Kentucky Pediatric Cancer Research Trust Fund was established by Senate Bill 82, sponsored by Senator Max Wise, in the 2015 legislative session. The Kentucky Pediatric Cancer Foundation was established in 2017 to mirror the work of the Trust Fund but allow individuals and businesses to make a tax-deductible contribution to support childhood cancer awareness and research for Kentucky children battling cancer. FOR MORE INFORMATION OR TO SET UP AN INTERVIEW: Contact Jamie Ennis Bloyd, President of the KY Pediatric Cancer Research Trust Fund and Director of Government Relations and External Affairs, American Childhood Cancer Organization at jbloyd@acco.org or 859-948-4626. [ii] Kentucky Cancer Registry, Age-Adjusted Childhood Cancer Incidence Rates, Central Nervous System, 2010-2014. US Compared to non-Appalachian and Appalachian Kentucky – all rates per 1,000,000 and p < .05.